Hatters midfielder Alan McCormack isn’t remotely interested in any talk of the League Two title, until promotion has finally been secured. 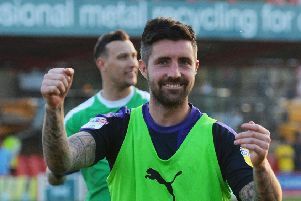 With seven games to go, Luton went back to the top of the table on goal difference by beating Barnet 2-0 on Saturday, with previous leaders Accrington not in action. First and foremost, our job is to get promoted. That was the aim at the start of the season, that’s the club aim, the fans aim. Stanley do still have two games in hand, and when asked about his ambitions of having a champions medal around his neck in May, McCormack said: “Firstly, our aim is to be promoted. “Whatever stage of the season that promotion happens, then you look at where you are from top and then you try to win it from there. “First and foremost, our job is to get promoted. That was the aim at the start of the season, that’s the club aim, the fans aim. With the ball in Accrington’s court, John Coleman’s side clearly have the toughest run-in, starting with a trip to Mansfield on Saturday. They then play seven games in April to Luton’s five, against Notts County, Colchester, Exeter, Yeovil, Wycombe, Newport and Lincoln, before finishing the campaign at Swindon. McCormack continued: “Accrington are flying, what is it 12 out of 13 they’ve won? “Can they keep that up until the end of the season? “If they do, fair play, absolutely fair play, you’ve got to hold your hands up and say they were good, but we don’t think they will. “Whether they think they will is another thing, but they’ve got a very tough run-in. We’ve got a tough run-in, but we know where we want to be, we’ve set our standards, set our targets and we’ve got to match that. Hatters continue their promotion push at Colchester on Good Friday and then entertain Mansfield on Easter Monday, knowing maximum points would virtually secure a top three position. On whether McCormack, who completed his first 90 minutes since September at the weekend expects to play in both matches, he added: “I’m not even thinking about Monday’s game. “You hear it all the time, you’re most important game’s your next game and Friday’s the most important game for us at the moment.